Dillon is a city in and the county seat of Beaverhead County, Montana, United States. The population was 4,134 at the 2010 census. The city was named for Union Pacific Railroad President Sidney Dillon. It was founded in 1880 as a railroad town. ↑ Gannett, Henry (1905). The Origin of Certain Place Names in the United States. Govt. Print. Off. p. 106. ↑ "Dillon History". Beaverhead County Museum. Beaverhead County Museum. Retrieved 2 February 2015. 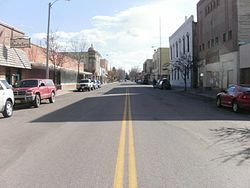 Wikimedia Commons has media related to Dillon, Montana. This page was last changed on 16 February 2019, at 19:05.